The India-based Neutrino Observatory (INO) is an effort aimed at building a world-class underground laboratory to study fundamental issues in science. It is a mega-science project under the XII five-year plan of Government of India with an investment of about 1538 crores, jointly funded by the Department of Atomic Energy (DAE) and the Department of Science and Technology (DST). The ambitious INO proposal has already drawn the worldwide attention of both national and international scientists. Once completed it will be the largest basic sciences project in India. At present, nearly 26 institutions and about 100 scientists are involved in the INO collaboration with Tata Institute of Fundamental Research, Mumbai, being the host institution. This large collaboration is the first of its kind in the country and is expected to grow further. The laboratory is to be located in Tamil Nadu as the steep slopes of the western ghats provide ideal and stable rock conditions for building a large underground cavern, safely, for long-term use. The primary goal of the laboratory is the study of neutrinos from various natural and laboratory sources using an iron calorimeter (ICAL) detector. It is envisaged that such an underground facility will develop into a centre for other studies as well, in physics, biology, geology, etc., all of which will make use of the special conditions that exist deep underground. The ICAL detector that will be installed in the INO laboratory will be the world's most massive detector. Such an effort will involve INO-Industry interface in a big way, in issues related to mechanical structure, electronics and detector-related technology. It is being developed completely indigenously. Apart from pursuing neutrino physics goals, the laboratory itself will greatly aid the development of detector technology and its varied applications (which have so far been in the areas of medical imaging). Students of science and technology within the country, particularly those residing in Tamil Nadu or neighbouring states, will have the opportunity to involve themselves in research involving cutting-edge science and technology. INO has no strategic or defence applications. Its operation involves no radioactivity release or toxic emissions. 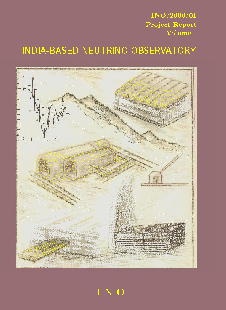 The India-based Neutrino Observatory (INO) is a proposed pure-Science underground laboratory. Its primary goal is to study the properties and interactions of weakly interacting, naturally occurring particles, called neutrinos. The objectives of the study are appended in simple layman's language at the end of this FAQ. There is world-wide interest in this field due to its implications for several diverse and allied fields such as particle physics, cosmology and the origin of the Universe, energy production mechanisms in the Sun and other stars, etc. In fact, other neutrino labs, also underground, have been running for several years in places such as Japan, Italy, and Canada. The experiments proposed at INO will be complementary in nature to the existing ones. While many experiments have studied neutrinos from the Sun and other stars, INO will study atmospheric neutrinos that are naturally produced by the interaction of cosmic rays in Earth's own atmosphere. Several groups belonging to different Universities, IITs and research Institutes in India are part of the collaboration working on the research & development of all components of INO. This is an open collaboration and interested people are welcome to join. The current proposal focusses on neutrino detection with static detectors, to be placed deep underground at a suitable site. A short account of the physics goals and implications is appended at the end of this FAQ. Where can one find detailed information about INO? The websites provides the current status and is continuously updated. We appreciate inputs from our scientific colleagues. It also contains information for students and non-technical material accessible to the general public. What are the highlights of the proposal? 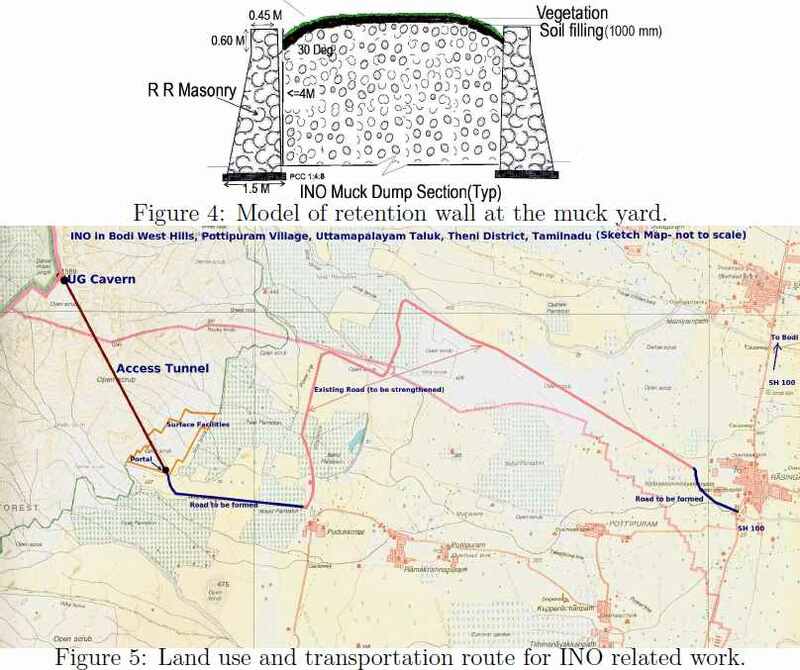 The INO proposal consists of creating two underground laboratory caverns with a rock cover of more than 1000 metres all around to house detectors and control equipments. 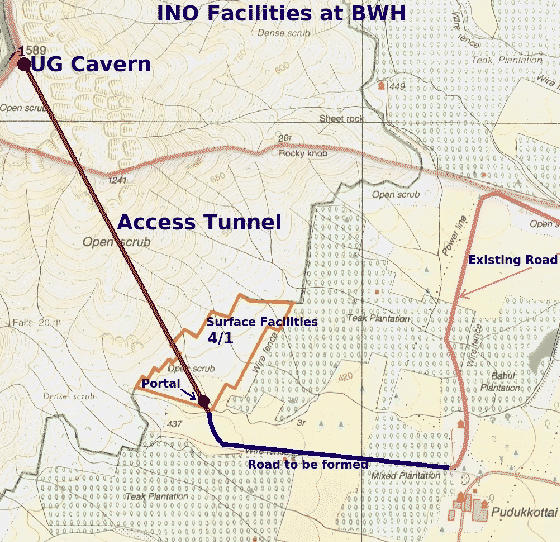 An access tunnel of length 2 km (approximate) to reach the underground laboratory will be driven under a mountain to reach the laboratory caverns. The surface facilities near the portal will consist of a laboratory and some housing for the scientists, engineers and operating staff. There will be no other tunnels and hence no disturbance on top or the sides of the mountain; the only entrance to the underground cavern will be at the bottom of the mountain. A sketch of INO facilities is shown in Fig.1. Figure 1: A sketch of INO facilities. Shown is the laboratory cavern under the peak, access tunnel to reach the cavern. The inset shows the lab facilities and the tunnel cross section. What will be the detector that will be housed at INO? The detector housed in the INO laboratory initially will be a magnetised iron calorimeter detector (ICAL). It is a static device without moving parts. Just as a telescope observes the sky through visible light, the ICAL will observe the sky through neutrinos. Charged particles produced in the rare interactions of neutrinos with the iron (constituting the 50 kton, 1.3 Tesla magnet) will be detected in glass based detectors called RPCs sandwiched between successive iron layers. The penetrating ones, such as muons, will be tracked in space and time to identify their charge (+/−) and momentum. Will there be any radioactivity? No. The main reason for locating the laboratory underground is to create an environment free of the radiation that abounds on the Earth’s surface. This radiation is due to cosmic rays and natural radiation of the materials around us. Hence the experiment will neither produce any radioactivity nor can it function well where there is radiation (at the Earth’s surface). Will there be hazardous chemicals and gases? The RPC detectors measuring the impact of charged particles produced in neutrino interactions with the iron consist of glass sheets kept at a precise separation and hermetically sealed to maintain the purity of a certain kind of gas mixture at about atmospheric pressure. The gas mixture used in the experiment consists of mainly argon, freon (environmentally friendly variety that is now used in all modern refrigerators), small quantities of isobutane and trace amounts of sulphur hexafluoride. These are used regularly in all laboratory environments and the mixture that will be used will conform to international standards of safety. The gas mixture is recycled many times before it is let out in small volumes. The ventilation system mixes the released gases with air to ensure the safety of every one. This is more a precaution to ensure the safety of the workers inside the laboratory. The proposed site for INO is located in the Bodi West Hills region, about 2 km from the nearest village Pudukottai in Pottipuram Panchayat, Theni District of Tamil Nadu. The nearest major city is Madurai about 110 km away. It is also the nearest airport and a major railway station. Figure 2: Figure showing the proposed location of the INO project near Pudukottai village. Also shown is the road, to be formed, that will be used for access and transportation. The portal is proposed to be located outside the RF boundary in puramboke (revenue) land along with surface facilities. This land, about 26.85 Ha in area, has now been aquired for INO. The Cavern will be located about 1300 metres deep under the 1589 peak (see Fig.2). The proposed site for INO is located in the Bodi West Hills region, about 2 km from the nearest village Pottipuram, Theni District of Tamil Nadu. The nearest major city is Madurai about 110 km away. It is also the nearest airport and a major railway station. The portal (entrance to tunnel), the lab complex and the surface will be in Theni district. While the laboratory and surface facilities are open to the public with prior permission, admission to the area will be regulated based on safety and operational considerations. What were the factors in deciding the location of the project? 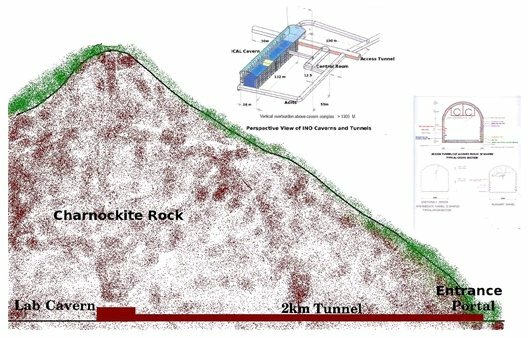 Since the laboratory cavern needs to be more than 1000 m underground (so that there is at least 1000 m cover all-round to absorb/reduce natural cosmic radiation), the choice of site is primarily dictated by the rock quality, in order to obtain a stable safe environment for such long-term activity. Geologically, southern Indian mountains have the most compact, dense rock (mostly gneiss) while the Himalayas are mostly metamorphic sedimentary rock with pockets of gneiss. A considerable area of peninsular India, the Indian Shield, consists of Archean gneisses and schists which are the oldest rocks found in India. While the Karnataka region has more schistic type rocks, the rock found in BWH is mainly Charnockite, which is the hardest rock known. The mountains of Tamil Nadu, in general, are the most attractive possibility, offering stable dense rocks with maximum safety for locating such a laboratory. Apart from this, availability of water and power and easy access to the site for maximum work efficiency are other factors. What are the time frames for the project from time zero? The present road map envisages that the first module of the detector will start taking data at the end of five years. Immediately after that the subsequent modules will be constructed. The first year of the project will be devoted to exploration, finalisation of designs, identifying the contractors etc. The next two years will involve excavation of the tunnel and laboratory cavern. During the last two years the laboratory equipment and detector construction will begin. How many people are to be located at the site? During the construction phase there will be a work force numbering about 100 or so. During the heavy construction phase the personnel needed includes civil engineers, drilling crews, truck drivers and concrete workers. There will also be design, architectural, and engineering crews along with geologists. The finishing work will require electricians, ventilation engineers, and environmental engineers. As described in our proposal, we estimate that the project will employ several permanent staff members and visiting scientists drawn from several laboratories. Only a small fraction of these will spend a substantial part of their time at the underground laboratory. About 20-30 scientists and engineers will stay permanently at the location for operational reasons apart from a floating population of students and scientists. What will be the environmental impact of INO? The impact will be mainly during construction period; after construction ends within a few years, the lab will be maintained by a small staff with some students and scientists and will have negligible environmental impact. All efforts will be made to minimise and manage the impact during construction. Does INO have an environmental policy? Yes. The challenge for INO is to build a world-class science laboratory, keeping in mind the ecological and environmental concerns, especially during the construction phase, and to actively participate in on-going conservation efforts in the region. It is imperative to recognise that the study of Nature’s innermost workings need not be at loggerheads with Nature itself. Models of S & T development that are sensitive to environmental conservation thus assume importance. The proposed India-based Neutrino Observatory (INO) offers immense opportunities and a challenge for realising such a model. Where is water for the project coming from? Water will be piped in from outside. The Tamil Nadu Water and Drainage Board (TWAD) has been approached to provide a suitable water source which will not affect the present usage in local villages. How will you manage electricity when there are severe power cuts? The power consumption, when the laboratory is fully functional, is about 3MW which will be sourced from the Sub-station in Rasingapuram directly. Further, when there is a power cut, diesel generators will be used to the capacity required. Possibility of using wind generator is being explored. What happens when there is an earthquake or rock burst? How will you ensure that noise from blasting does not disturb the environment or people? Controlled blasting will be adopted in the intitial reaches to dampen noise and vibrations. Blasting noise lasts only a fraction of a second and is not a continuous disturbance. Blasting to be carried out for excavation of the cavern and associated components underground is likely to cause low vibrations. However, it is likely to be much lower because of the overburden of hard rocks and soils, except in the case of the initial sections of the tunnels. 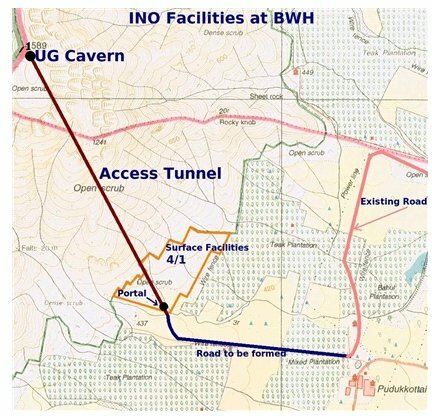 Nevertheless, INO will undertake ground vibration monitoring study during actual execution of the project along with other rock mechanics and instrumentation studies as done in similar underground project already commissioned nearby. The ground vibration may be measured continuously during blasting operations for all the major components of the project. Appropriate blasting pattern and modern blasting techniques based on the actual site geology, may be adopted such that vibration due to the blasting is the minimum. Estimated particle velocities are shown in Fig.3. For example, at 500 m from the portal it is approximately 3.4 mm/s and on the peak above cavern (about 2000 m from portal) it is approximately 0.5 mm/s. 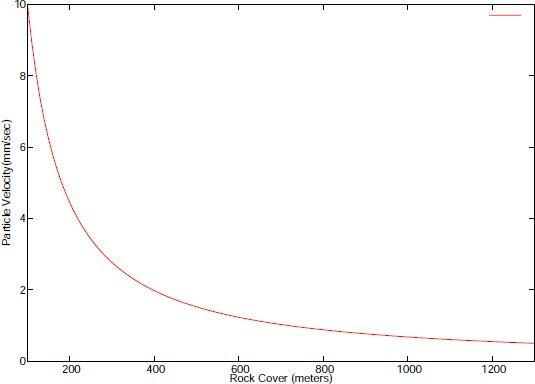 Figure 3: The particle velocity (m/s) as a function of rock cover (in m). INO laboratory is situated deep under ground, about 1300 m below the hill peak. The tunnels and caverns will be excavated through controlled blasting in the initial reaches.Initial stages of blasting will be two pulls in daylight hours only. When both noise and vibration levels subside, deeper underground, there will be three pulls of blasting per day. During the operation phase, there will be a workshop and a detector assembly facility to assist day-to-day maintenance. It will not have any noise-generating heavy machinery. In the utility building located next to the portal, modern chillers and blowers, with reduced noise levels, will be used. Silent DG sets will be installed within the utility building. Indigenous trees will be planted around the utility building for further damping of noise during operation phase. How much muck will be generated? The first few tens meters or so (till stable rock face is reached) of the tunnel will be executed through cut and cover method. The top soil removed during this stage will be stored separately and reused for backfilling/greening the dump yard. Most of the muck to be disposed of will consist of rubble stones/boulders debris, which has great use in road re-laying and construction activities. The tentative estimate for the total tunnel debris generated during excavation of underground components, including allowance for about 18% voids, is approximately 224,000 cubic meters as shown in the Table. As the tunnel is in stable hard rock, the dust generated will be minimal (less than 10% of the total rock muck). The processed rock debris generated during excavation is used effectively to replace (about 80% of) the sand required for construction of both underground and surface facilities. This quantum will be generated over a 3 year period. About 20% of this will be consumed for INO works; for tunnel and cavern floor, for concrete lining and shot creting of tunnels/caverns, levelling and in construction of buildings and facilities. Efforts will be made to evacuate muck as it is generated, minimising storage at the site. Where will you store this muck? Also, it is very windy 6 months of the year. How will you protect adjoining areas? The muck store yard will be protected by dry stone masonry wall, all around except for entry and exit points, to prevent contamination of any nearby water sources. This will also reduce wind effect. A protective wind fence using either metal sheets (as is done in urban areas) or fabric will be placed around the muck storage yard above the wall to prevent spread of particulate matter. How will you arrange for there to be no dust on roads? The standard solution is water-spraying and covering the transport vehicles. If you are using generators, how will you reduce noise and air pollution? Silent generators will be used. Appropriate trees will be planted around the utility building to further reduce noise. ">If you are using generators, how will you reduce noise and air pollution? Silent generators will be used. Appropriate trees will be planted around the utility building to further reduce noise. Silent generators will be used. Appropriate trees will be planted around the utility building to further reduce noise. will you make sure that the road is suitably built and maintained? All material transportation will be done using the direct road from the site to the state highway near Rasingapuram completely avoiding the transportation through the villages (see Fig.5). The number of vehicles used for transportation will be regulated based on the existing traffic pattern on these roads. There are three components to the issue of transportation: Firstly, the mud road leading to the portal (with bridge crossing the stream) will be upgraded to a two lane road (about 1900 metres long). Secondly, the existing metalled road, up to the outskirts of Rasingapuram will be widened using its present width itself. Thirdly, a by-pass road to the extent of about 0.5 to 1km will be constructed to avoid going through Rasingapuram. Most of this will lie in the revenue puramboke land. No restriction on the use of the road constructed for the project will be imposed. We are requesting the state government to help us in this construction and maintenance. How much land will you acquire (agricultural or residential) for broadening roads? No residential lands will be needed for this purpose. It is planned to set up INO facilities in puramboke land and no agricultural land will be required. Lots of animals graze in this area. If you put an electric fence they cannot graze there. No electric fence will be constructed. There are two "vaaykaals" or streams that fill the kolams (tanks). If your portal blocks them, then we won't get water. No, we will not block the streams. The present proposal envisages building a bridge on one of them to provide access to the portal. If you spray water to reduce the dust, where will this water come from? Even if you source it from outside, where will TWAD board get it from? This requirement is temporary and only during the initial construction period. Sprinklers are designed to use minimum amount of water. This is not a major requirement. The excavation and other activities must not harm the people or the environs. Can you ensure this? There will be no harm from rock excavation; several kilometers of tunnels have been safely built by the TNEB in the Theni district. There will be no damage to any buildings or other structures. There are no trees in the area demarcated for portal and surface facilities. Only thorny bushes are there. Only minimal area required for construction activities will be cleared. Once the construction is over, INO is committed to planting indigeneous variety trees as advised by the forest department. Inside heat will come out and will cause a problem for agriculture. How will you deal with it? No heat will be generated from the tunnels and caverns. Hence no harm will come for agriculture in the surrounding areas. Such projects are only in the sea. Even if they are on land, where are they? There are two projects in the sea- one in Antartica and another one in Mediteranian sea. All others are on land and in towns with human habitation, such as Kamioka in Japan, Gran Sasso in Italy and SNO in Canada. They are all running safely for many years now. More are being proposed to be constructed in United States, China and South Korea. Is it true that radioactivity from the lab may cause birth defects in children? Not true. There will be no radioactivity or toxicity resulting from INO laboratory. If you are building a world-class lab, all the world’s eyes will be on it and so what if an atom bomb is then dropped on us? INO has no strategic or defense related importance. It is an educational and research laboratory. It is unlikely to be a target for any bomb, let alone atom bomb. How will you ensure the safety and security of the common people when implementing this project? By suitable precautions like cordoning off blasting area, appropriate warning boards and flags, safety training of workers, safety /protective gear for all people at construction site, adoption of work procedures approved by safety group, preventing access of dependent children to work sites, etc. Efforts will be made to improve the infrastructure and academic standards of the surrounding schools as permitted by governing rules. Exhibitions and other similar facilities will be arranged to enhance the scientific spirit of the local youngsters, etc. Does INO have an outreach programme? The INO collaboration is very keen on scientific outreach possibilities such as interactions with neighbourhood schools and colleges as well as with physics research and teaching groups from all over India. Small and short-term projects and other activities are envisaged to increase scientific awareness and temper and involve students from all interested Institutions. In the initial stages, the INO collaboration is also keen to inform the general public about the project and that it will not harm the environment. Hence local support and awareness are crucial. What changes will you bring to the people and their livelihood? Neutrinos are tiny, neutral, elementary particles which interact with matter via the weak force. The weakness of this force gives neutrinos the property that matter is almost transparent to them. The Sun, and all other stars, produce neutrinos copiously due to nuclear fusion and decay processes within their core. Since they rarely interact, these neutrinos pass through the Sun, and even the Earth, unhindered. There are many other natural sources of neutrinos including exploding stars (supernovae), relic neutrinos (from the birth of the universe), natural radioactivity, and cosmic ray interactions in the atmosphere of the Earth. For example, the Sun produces over two hundred trillion trillion trillion neutrinos every second, and a supernova blast can unleash 1000 times more neutrinos than our Sun will produce in its 10-billion year lifetime. Billions of neutrinos stream through our body every second, yet only one or two of the higher energy neutrinos will interact with you in your lifetime. The neutrino was proposed by Wolfgang Pauli in 1930; but it took another 26 years for it to be actually detected. In 1956 Reines and Cowan found evidence of neutrino interactions by monitoring a volume of cadmium chloride with scintillating liquid near to a nuclear reactor. Reines was jointly awarded the Nobel Prize in Physics in 1995 in part for this revolutionary work. We now know that not just one but at least three types or flavours of neutrinos and their anti-particles exist in nature. They have a tiny mass whose value is still not known. Moreover, they exhibit a quantum-mechanical phenomenon in which one type of neutrino oscillates into another as it propagates in space; this is called neutrino oscillation and this observation has generated immense excitement in the particle physics community. From recent experiments we know that the mass of the neutrino is non vanishing, but we are unsure how large the masses of the three individual neutrino types are because of the difficulty in detecting neutrinos. This is important because neutrinos are by far the most numerous of all the particles in the universe (other than photons of light) and so even a tiny mass for the neutrinos can enable them to have an effect on the evolution of the Universe through their gravitational effects. There are other recent astrophysical measurements that provide information on the evolution of the Universe and it is crucial to seek complementary information by direct determinations of the masses of neutrinos and their other properties. In a sense, neutrinos hold the key to several important and fundamental questions on the origin of the Universe and the energy production in stars. We have some partial answers but many details are still awaited from future experiments. impossible to detect them on the surface of the Earth. This is the reason most neutrino observatories are located deep inside the Earth’s surface. The overburden provided by the Earth matter is transparent to neutrinos whereas most background from cosmic rays is substantially reduced depending on the depth at which the detector is located. One of the earliest laboratories created to detect neutrinos underground in the world was located more than 2000 m deep at the Kolar Gold Field (KGF) mines in India. The first atmospheric neutrinos were detected at this laboratory in 1965. This laboratory has been closed due to the closure of the mines. Most underground laboratories around the world are located at a depth of a km or more. There are two types of underground laboratories: either located in a mine or in a road tunnel. There are now four major laboratories around the world: in Sudbury in Canada, Kamioka in Japan, under the Gran Sasso mountains in Italy and in Soudan mines in the USA. Several others are planned including INO which is an attempt to recapture the pioneering studies on neutrinos at KGF. An overburden in excess of 1000 m in all directions1, to manage the cosmic ray background. Any site has to satisfy this minimal requirement as part of the physics considerations. Rock stability is an important criterion from the point of view of safety. This is the largest ever underground lab to be constructed in India at such a depth. Availability of advance geotechnical information is very important for assessing risks. Stability of rock, rock density and compactness are also crucial for managing the detector load factor. it is a crucial ingredient for the design and stability of the underground detector as well as all surface facilities at the site, especially for the life span of such a laboratory (50-100 years). A complete 3D topo map of the region must be available for evaluating backgrounds. Low rainfall area of about 75-100 cm per annum is needed for operating detectors which are sensitive to humidity. Adequate water for cooling the magnets that will provide magnetic fields in excess of 1 T is needed to be available at all times apart from the water needed for A/C for the lab. Given the nature of the basic requirements, the project location will invariably be located near/in an ecologically and environmentally sensitive area. The impact will be mainly during construction period - it should be possible to minimise and manage the impact during construction; there will be negligible impact during operation. It is important to remember that riding on an existing project is preferable to an entirely new site. This will also reduce the time gap between the start of the project and the time when the detectors are installed. 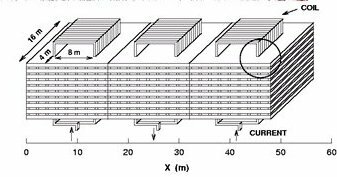 1Typically, unless the cavern is under a plateau, this implies a vertical overburden in excess of 1200 m.
Again this may be reduced if many aspects of the associated in- frastructure are available due to the presence of another larger project at the same location. It is important to have quick access to the laboratory from major cities with good industrial infrastructure. Distances to various future possible neutrino factories and any par- ticular advantage that may be there due to physics reasons. Long-term availability of the site. INO has been conceived on a scale that no other basic sciences project in India has attempted. The MoU signed by seven institutions, that brought the Neutrino Collaboration Group into existence, is already the first of its kind. It is a testimony to the enthusiasm and collaborative spirit shown by the scientific community in India. In the first phase of its operation a magnetised iron calorimeter detector, weighing about 50,000 tons, will be used for studying neutrinos produced from cosmic rays in Earth’s atmosphere. The aim is to make precision measurements of the parameters related to neutrino oscillations. An exciting possibility is to determine the ordering of the neutrino masses which is not very well known at present. This is one of the fundamental open questions in neutrino physics and no other detector either existing or planned except perhaps NOνA may be able to provide an answer in the next 10 years. Because of its ability to distinguish the positive and negative muons, this detector can settle this question. This detector can also be used as the far-detector of a long-base-line (6000 to 11500 km) neutrino experiment using the neutrino beam from a neutrino factory in Japan, Europe or USA. These are neutrinos that will be produced in a future accelerator facility which are beamed towards the detectors situated in a different part of the Earth. This is envisaged as the second phase of the INO activity, and is a long-term goal, since neutrino factories are yet to become a reality. However, there is considerable interest in this possibility not only for the rich physics potential but also because the proposed detector at INO will be capable of charge identification, which is crucial for this mode of operation. INO will have an impact on the emerging high energy physics scenario in the country. People trained at INO will not only participate here but also have the expertise to contribute to other high energy and nuclear physics projects around the world. Over the long term INO is expected to develop into a world class underground science laboratory straddling many fields like physics, biology, geology and allied engineering fields. Members of INO are acutely aware that the laboratory is likely to be located in an environmentally and ecologically sensitive environment. During its normal operation phase, the laboratory is not expected to cause any damage to the environment. All efforts will be made to minimise the disturbance during the construction phase. INO is looking for scientists and engineers who will enjoy the challenge of setting up an entirely new facility to do world class research. Now is the right time to join us and make a difference!